I’ve done a lot of work in the past few weeks on Gravity Sim. Besides upgrading to the latest version of Unity 5, the latest version now has “fiery” trails following the planets. 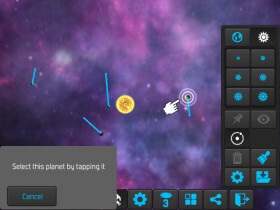 It also boasts new planet and star models, and an extensive tutorial for new users. The most important new feature in Gravity Sim is the tutorial which introduces the app to new users. It’s a step-by-step, interactive explanation of how the app works, demonstrating editing a scene and giving a brief overview of the most important controls. By default, it’s disabled for existing users. If you already have the app and want to try the tutorial, the options menu has a new tick box which can be used to activate the tutorial it next time the app starts. I’ve made a change to the way planets or stars are added to the scene. 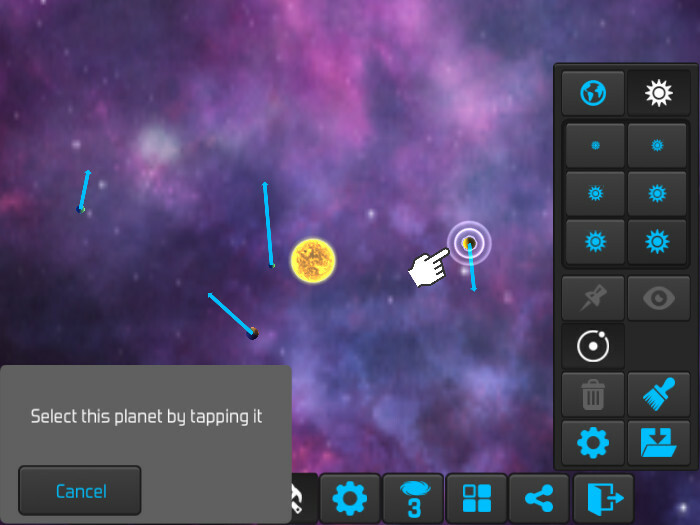 In the old version, selecting a planet size allowed you to tap around the screen adding planets. 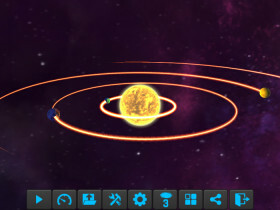 This sometimes resulted in a planet being added when a user was simply trying to click on an existing planet but missed. To avoid this, I’ve made the size buttons turn off once an object has been added. To keep adding objects, you’ll have to choose the size first, every time. It’s more intuitive this way, and less prone to error. Now that support for Unity 4 has officially ended, I’ve upgraded all of the 3rd party tools used in Gravity Sim to the latest versions which support Unity 5. For all but one of the plug-ins, this was a simple process. The problematic one was abandoned by the developer late last year, and while it doesn’t complain when imported into Unity 5, it doesn’t officially support it. Because of this I can’t be sure it would remain stable, so I’ve had to replace it. This was a big job which involved re-working all of 3D graphics in the app. Another big change was getting rid of the sub-par trails that follow the planets. These were built in to Unity, and while not particularly attractive, they did work… at least until Unity 5 arrived. In the latest version, the standard trails don’t work anymore. This forced me to replace them with a completely different trails package. The new trails look a lot better than the old ones, and they bear a striking resemblance to the fiery trails seen on the splash screen. Space news #15: Evidence of alien life within a decade?